This picture comes from Russ Chandler. When I heard DCI was planning on having a competition in my hometown, I knew that I had to become involved. I marched Sky Ryders in 1983, so I knew that a standstill performance would get the locals pumped up! 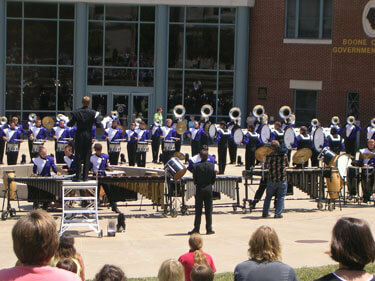 I volunteered with DCI to help promote the DCI Columbia major event locally. Memphis Sound was nice enough to agree to come a day early to help promote the show on local TV and with a concert the day before. My daughter took this picture of the corps playing the concert in Courtyard Square in downtown Columbia. Thanks again Trey Moore and Memphis Sound for helping rev up the locals!